Shirley Ann Jackson FREng (born August 5, 1946) is an American physicist, and the eighteenth president of Rensselaer Polytechnic Institute. She received her Ph.D. in nuclear physics at the Massachusetts Institute of Technology in 1973, becoming the first African-American woman to earn a doctorate at MIT. Jackson was born in Washington D.C. Her parents, Beatrice and George Jackson, strongly valued education and encouraged her in school. Her father spurred on her interest in science by helping her with projects for her science classes. At Roosevelt High School, Jackson attended accelerated programs in both math and science, and graduated in 1964 as valedictorian. Jackson began classes at MIT in 1964, one of fewer than twenty African American students and the only one studying theoretical physics. While a student she did volunteer work at Boston City Hospital and tutored students at the Roxbury YMCA. She earned her bachelor's degree in 1968, writing her thesis on solid-state physics. Jackson elected to stay at MIT for her doctoral work, in part to encourage more African American students to attend the institution. She worked on elementary particle theory for her Ph.D., which she completed in 1973, the first African-American woman to earn a doctorate degree from MIT. Her research was directed by James Young. Jackson was also the second African American woman in the United States to earn a doctorate in physics. As a postdoctoral researcher of subatomic particles during the 1970s, Jackson studied and conducted research at a number of prestigious physics laboratories in both the United States and Europe. Her first position was as research associate at the Fermi National Accelerator Laboratory in Batavia, Illinois (known as Fermilab) where she studied hadrons. In 1974 she became visiting scientist at the European Organization for Nuclear Research (CERN) in Switzerland. There she explored theories of strongly interacting elementary particles. In 1976 and 1977, she both lectured in physics at the Stanford Linear Accelerator Center and became a visiting scientist at the Aspen Center for Physics. At one time her research focused on Landau–Ginsburg theories of charge density waves in layered compounds, and has studied two-dimensional Yang-Mills gauge theories and neutrino reactions. I am interested in the electronic, optical, magnetic, and transport properties of novel semiconductor systems. Of special interest are the behavior of magnetic polarons in semimagnetic and dilute magnetic semiconductors, and the optical response properties of semiconductor quantum-wells and superlattices. My interests also include quantum dots, mesoscopic systems, and the role of antiferromagnetic fluctuations in correlated 2D electron systems. Jackson joined the Theoretical Physics Research Department at AT&T Bell Laboratories in 1976, examining the fundamental properties of various materials. She began her time at Bell Labs by studying materials to be used in the semiconductor industry. In 1978, Jackson became part of the Scattering and Low Energy Physics Research Department, and in 1988 she moved to the Solid State and Quantum Physics Research Department. At Bell Labs, Jackson researched the optical and electronic properties of two-dimensional and quasi-two dimensional systems. In her research, Jackson has made contributions to the knowledge of charged density waves in layered compounds,polaronic aspects of electrons in the surface of liquid helium films, and optical and electronic properties of semiconductor strained-layer superlattices. On these topics and others she has prepared or collaborated on over 100 scientific articles. Jackson served on the faculty at Rutgers University in Piscataway and New Brunswick, New Jersey from 1991 to 1995, in addition to continuing to consult with Bell Labs on semiconductor theory. Her research during this time focused on the electronic and optical properties of two-dimensional systems. In 1995, President Bill Clinton appointed Jackson to serve as Chairman of the U.S. Nuclear Regulatory Commission (NRC), becoming the first woman and first African American to hold that position. At the NRC, she had "ultimate authority for all NRC functions pertaining to an emergency involving an NRC licensee." On July 1, 1999, Jackson became the 18th president of Rensselaer Polytechnic Institute. She was the first woman and first African American to hold this position. Since her appointment to president of RPI, Jackson has helped raise over $1 billion in donations for philanthropic causes. Jackson is leading a strategic initiative called The Rensselaer Plan and much progress has been made towards achieving the Plan's goals. She has overseen a large capital improvement campaign, including the construction of an Experimental Media and Performing Arts Center and the East Campus Athletic Village. She enjoys the ongoing support of the RPI Board of Trustees. On April 26, 2006, the faculty of RPI (including a number of retirees) voted 155 to 149 against a vote of no-confidence in Jackson. In the Fall of 2007, the Rensselaer Board of Trustees suspended the faculty senate, thus prompting a strong reaction from the Rensselaer community that resulted in various protests including a "teach in". Since arriving at RPI, Jackson has been one of the highest-paid university presidents in the nation. Her combined salary and benefits have expanded from $423,150 in 1999–2000 to over $1.3 million in 2006-07 and to $2.34 million in 2010. In 2011 Jackson's salary was $1.75 million. In 2006-07 it is estimated she received another $1.3 million from board seats at several major corporations. The announcement of layoffs at RPI in December 2008 led some in the RPI community to question whether the institute should continue to compensate Jackson at this level, maintain a $450,000 Adirondack residence for her, and continue to support a personal staff of housekeepers, bodyguards and other aides. In July 2009, the news reported on the construction of a 10,000-square-foot (930 m2) mountain-top home in Bolton, New York, overlooking Lake George. A water-quality activist raised concerns about possible environmental hazards from the construction of a driveway, but according to Department of Environmental Conservation officials, the work was in compliance. In its 2009 review of the decade 1999–2009, McClatchy Newspapers reported Jackson as the highest-paid currently sitting college president in the U.S., with a 2008 salary of approximately $1.6 million. On December 4–5, 2009 Jackson celebrated her 10th year at RPI with an extravagant "Celebration Weekend", which featured tribute concerts by Aretha Franklin and Joshua Bell among other events. Following the weekend, the Board of Trustees announced they would support construction of a new guest house on Jackson's property, for the purpose of "[enabling] the president to receive and entertain, appropriately, Rensselaer constituents, donors, and other high-level visitors". It was later reported that Jackson's current house on Tibbits Avenue has 4,884 square feet (453.7 m2) of space, seven bedrooms and five bathrooms, and an estimated value of $1,122,500. The trustees said that "the funds for this new project would not have been available for any other purpose". William Walker, the school's vice president of strategic communications and external relations noted "The board sees this very much as a long-term investment … for President Jackson and her successors." On February 2, 2010, the Troy Zoning Board of Appeals denied RPI's request for a zoning variance allowing them to construct the new house at a height of 44 feet (13 m), which would exceed the 25-foot (7.6 m) height restriction on buildings in residential areas. The Zoning Board stated that it is "too big", and two firefighters believed the property would be difficult to access with emergency vehicles. A new plan was announced on February 25, describing how the president's house will be replaced with a new two-story house. The new house will have "9,600 square feet of livable space, divided approximately equally between living space for the president's family and rooms for the president to conduct meetings and events". In June 2010, it was discovered that the newest plans for the house showed a new size of 19,500 square feet (1,810 m2), causing the city of Troy to issue a stop-work order until additional building fees were paid. In June 2010, it was announced that the Rensselaer Board of Trustees unanimously voted to extend Jackson a ten-year contract renewal, which she accepted. Shirley Ann Jackson's compensation ranked 1st among USA private university presidents in 2014. Her achievements in science and education have been recognized with multiple awards, including the CIBA-GEIGY Exceptional Black Scientist Award. In the early 1990s, Governor James Florio awarded her the Thomas Alva Edison Science Award for her contributions to physics and for the promotion of science. In 2001 she received the Richtmyer Memorial Award given annually by the American Association of Physics Teachers. She has also received many honorary doctorate degrees. She was inducted into National Women's Hall of Fame in 1998 for "her significant contributions as a distinguished scientist and advocate for education, science, and public policy". Jackson has also been active in professional associations and in serving society through public scientific commissions. In 1985, Governor Thomas Kean appointed her to the New Jersey Commission on Science and Technology. She is an active voice in numerous committees of the National Academy of Sciences, the American Association for the Advancement of Science (AAAS), and the National Science Foundation. Her continuing aim has been to preserve and strengthen the U.S. national capacity for innovation by increasing support for basic research in science and engineering. This is done in part by attracting talent from abroad and by expanding the domestic talent pool by attracting women and members of under-represented groups into careers in science. In 2004, she became president of the American Association for the Advancement of Science and chaired the AAAS board in 2005. In spring 2007, she was awarded the Vannevar Bush Award for "a lifetime of achievements in scientific research, education and senior statesman-like contributions to public policy". Jackson continues to be involved in politics and public policy. In 2008 she became the University Vice Chairman of the U.S. Council on Competitiveness, a non-for profit group based in Washington, D.C.. In 2009, President Barack Obama appointed Jackson to serve on the President’s Council of Advisors on Science and Technology, a 20-member advisory group dedicated to public policy. She was appointed an International Fellow of the Royal Academy of Engineering in 2012. She received a Candace Award for Technology from the National Coalition of 100 Black Women in 1982. 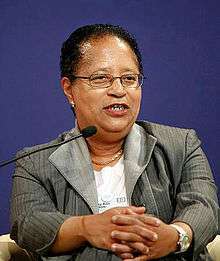 Shirley Jackson is married to Morris A. Washington, a physics professor at Rensselaer Polytechnic Institute, and has one son, Alan, a Dartmouth College alumnus. 1 2 3 "List of Fellows". 1 2 3 4 Jackson profile at RPI Archived April 7, 2015, at the Wayback Machine..
1 2 AAAS article on President Jackson Archived July 6, 2011, at the Wayback Machine. 1 2 3 4 5 6 7 Williams, Scott. "Physicists of the African Diaspora". Retrieved December 31, 2009. ↑ Svitil, kathy. "The 50 Most Important Women in Science". Discover Magazine. Kalmbach Publishing Co. Retrieved December 15, 2014. ↑ No-Confidence Motion Fails at Rensselaer Polytechnic Archived April 16, 2008, at the Wayback Machine..
↑ RPIconcerns – via YouTube. ↑ "Dr. Shirley Ann Jackson is highest-paid university president in the nation". Jet. 2003. Retrieved December 27, 2008. The "highest-paid" accolade is also sometimes directed at Ohio State University's Gordon Gee. 1 2 3 "For RPI, priorities an issue". Times Union. Archived from the original on December 25, 2008. Retrieved December 27, 2008. ↑ "Private college presidents pay was up slightly". Boston Globe. September 12, 2012. ↑ Adams, Susan (December 15, 2013). "The Highest-Paid College Presidents". Forbes. Retrieved February 16, 2014. ↑ "Mansion causes pollution concern". WNYT. July 21, 2009. Archived from the original on December 10, 2014. Retrieved July 22, 2009. ↑ http://news.yahoo.com/s/mcclatchy/3387449 Archived January 2, 2010, at the Wayback Machine. ↑ "Celebration Weekend: A Tribute to the Renaissance at Rensselaer". Retrieved December 31, 2009. ↑ "Rensselaer Announces Celebration Weekend Event Lineup". Retrieved December 31, 2009. 1 2 "BREAKING NEWS: New Presidential Home to Be Constructed". December 7, 2009. Retrieved December 31, 2009. 1 2 Churchill, Chris (December 8, 2009). "RPI president to get new campus home residence". The Times Union. Archived from the original on December 15, 2009. Retrieved December 31, 2009. ↑ "Zoning Board of Appeals denies RPI mansion". Retrieved February 19, 2010. ↑ Sherman, Erica (March 3, 2010). "Jackson house to be razed". The Rensselaer Polytechnic. Retrieved April 4, 2010. ↑ Rounds, Claude (February 25, 2010). "RE President's House Project (Email to RPI Community)". RPIisRPI.com. Retrieved February 25, 2010. ↑ Churchill, Chris (June 3, 2010). "City surprised by size of planned RPI presidential home". The Times Union. Retrieved June 8, 2010. ↑ "Rensselaer Polytechnic Institute Board of Trustees Votes Unanimously To Appoint President Shirley Ann Jackson for 10 More Years". rpi.edu. ↑ "Rensselaer President Leads List of Highest-Paid Private College Leaders". The New York Times. December 8, 2014. ↑ "President Jackson Elected Member of American Philosophical Society" Archived September 28, 2011, at the Wayback Machine.. May 7, 2007. ↑ "Archived copy". Archived from the original on August 6, 2016. Retrieved 2016-06-07. ↑ "President Shirley Ann Jackson Named Recipient of National Medal of Science". RPI.edu. Retrieved February 1, 2016. ↑ "President's Honorary Degrees - Rensselaer Polytechnic Institute (RPI)". rpi.edu. ↑ "President's Profile - Rensselaer Polytechnic Institute (RPI)". rpi.edu. Retrieved 2016-11-02. ↑ "Jackson, Shirley Ann - National Women's Hall of Fame". National Women’s Hall of Fame. Retrieved 2016-11-02. ↑ "Shirley Ann Jackson, Leader in Higher Education and Government, to Receive the Vannevar Bush Award" Archived March 3, 2016, at the Wayback Machine. NSF. March 27, 2007. ↑ "Shirley Ann Jackson Appointed to the President's Council of Advisors on Science and Technology" (Press release). RPI. April 27, 2009. Retrieved April 27, 2009. ↑ "CANDACE AWARD RECIPIENTS 1982-1990, Page 2". National Coalition of 100 Black Women. Archived from the original on March 14, 2003. Some material above is adapted from "Physicists of the African Diaspora", with permission of Dr. Scott Williams. June, Audrey (June 5, 2007). "Shirley Ann Jackson Sticks to the Plan" (PDF). The Chronicle of Higher Education.